Cats may be connoisseurs about food but they really don’t know the difference between toys you spend money on and regular household items you already have. They love to play with things you would otherwise discard, so why not let them have their way — with a few adjustments for safety? You could even make free cat toys just as esthetically appealing as the kind you buy in a store, and then use the savings to buy healthier pet food. Read on for ideas. Even if you don’t have a roll of aluminum foil in your kitchen, you probably end up with some if you ever order burritos for takeout. Roll some into a ball and the result will keep your cat entertained for hours at a time. Some balls make better cat toys than others, and if your cat still has full-length claws intact, you might not want to entrust your favorite sporting ball to your pet. That said, anything around the weight of a ping-pong ball or whiffle ball is ideal for feline entertainment — they move quickly across the floor and also make noise when rolling or bouncing on hard surfaces. Balls made out of plastic are also less likely to be punctured or bitten into a state in which they lose their utility. Some felines are so obsessed with bottle caps and jar lids of any size that you’d swear they were professional hockey players in another life — or at least it will seem like that when they are on tile or wooden flooring. Speaking of which, if you have wooden flooring, you may want to be careful about metal caps with corrugated edges — the kind that go on top plastic bottles of beer or soda — the corrugation may scuff or scratch off the varnish over time. Surely you’ve noticed that every time you empty a cardboard box, your cat can’t wait to dive into it. Perhaps you (subconsciously?) don’t let your cat spend much time in it because leaving it out makes it look like you’re neglecting your cleaning. 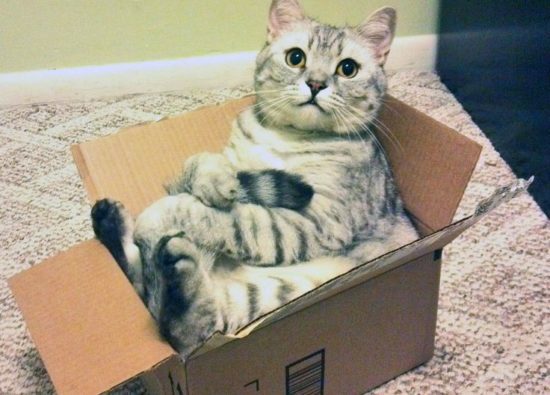 Instead, make the box look more like a deliberate furnishing for your pet. At the very least, you might remove the shipping labels and any branding so the box doesn’t look like refuse. Better than that, however, you could cover up the sides of the box with any kind of paper. Try decorating it with paint or marker, as long as you use a non-toxic variety. This combination results in a toy that gets you to interact with your cat — and it seems to never get old in their eyes. If you have any feather boas in your closet, you might have noticed that they tend to shed extra feathers. Collect these and any that might come out of pillows, down coats or jackets and tie a string to them. Make that string several feet long for the best effect. Then you can tie the other end to a stick or branch you might find outside. The resulting toy saves you a good $10 to $20 over the store-bought version of a classic favorite among the feline set. A more modest variation on the feather toy might replace the string and stick with the cardboard cyllinder that remains after you use up a roll of paper towels. Glue or tape the feathers to the end of the cyllinder. Hopefully you already own at least one flashlight for emergencies — and have a supply of backup batteries. If you break the flashlight out in the evening, you’ll some luck engaging your cat in playing with the light wherever you aim it; do it in broad daylight and it might not even register. Even better: If you already have a red laser pointer for use in presentations, that device tends to be the biggest hit with felines. They love to chase after the light and appear to be less likely to catch on to the fact that it’s originating from your hand as they eventually do when you use a flashlight for this same purpose. Hair ties have a tendency to become cat toys if you’re not careful about where you store them when you’re not wearing them. The thicker ones like scrunchies work better and are safer for your pet as well. The thinner hair bands may end up being eaten and vomited up. The same goes for plain rubber bands. You’ve probably already noticed that your pet loves to crawl into any bag you leave on the floor. Why not make it official — every time you come home with a bag, let your pet have at it. A word of caution about bags: if they have handles or ties on them, tear them off so your pet doesn’t accidentally put themselves into a noose. This is much likelier to become an issue with plastic bags that have handles. Perhaps for the same reason that bottle caps provide endless entertainment for cats, so too do the plastic rings that split apart from the bottom half of the lids on plastic bottles of milk and juices. Not all plastic bottles are flexible enough to enable you to free the ring from the neck of the bottle; but soap might provide enough lubrication to do the trick. Look for amounts of ribbon, yarn or even string that might be considered remainders — not enough to use for wrapping gifts or knitting. Tie them together to make a toy that’s too big for your pet to ingest in its entirety. Individual strands are much likelier to be swallowed, especially in the case of yarn or string. Used to keep plastic bags of bread closed, and also provided inside boxes of garbage bags for the same reason, you probably discard these wire bendable items — and even the plastic tab versions — after you’re done with them. Otherwise, if you’ve ever tried to save and reuse them, your cat has probably gotten a hold of them at least once and had a good time. You might as well just give all of the to your pet from now on, but make it safer: twine a bunch of them together into something too big for your cat to ingest. Remember to keep an eye on your cats when you first test out new toys. Anything they chew on might become something they swallow. Most likely they will vomit back up anything that isn’t good for their digestive systems, but if they take ill, then that free toy suddenly becomes expensive if you have to go to the vet. Speaking of your pet’s health, it will benefit if you vow to only make their toys so that you can use the money you save to buy healthier cat food. Readers, have you made any cat toys for your pets using things we haven’t mentioned here? Please tell us about it in the comments section and we’ll update the post accordingly. Retirement is the most expensive thing we save for. It isn’t a house or a car, but the lives we live once we punch that time clock for the last time. With more knowledge about healthy living and vastly improved healthcare, people are living much longer. This is wonderful, but that means you have to make your retirement savings last 30+ years. Here are some ways to help you save for retirement. If I could tell you to create a budget every time I wrote a post, I would. This is priority number one. Figure out how much you make. Track your spending. Then find out where you are at the end of the month. Trim spending where you can and make sure you save to your designated accounts at the start of the month. This forces you to save before you spend any money, instead of saving what’s left over. Living with less will simplify your life and help you save more money. By spending less on things and nights out, you have more to put away for retirement. Make paying off debt a priority. 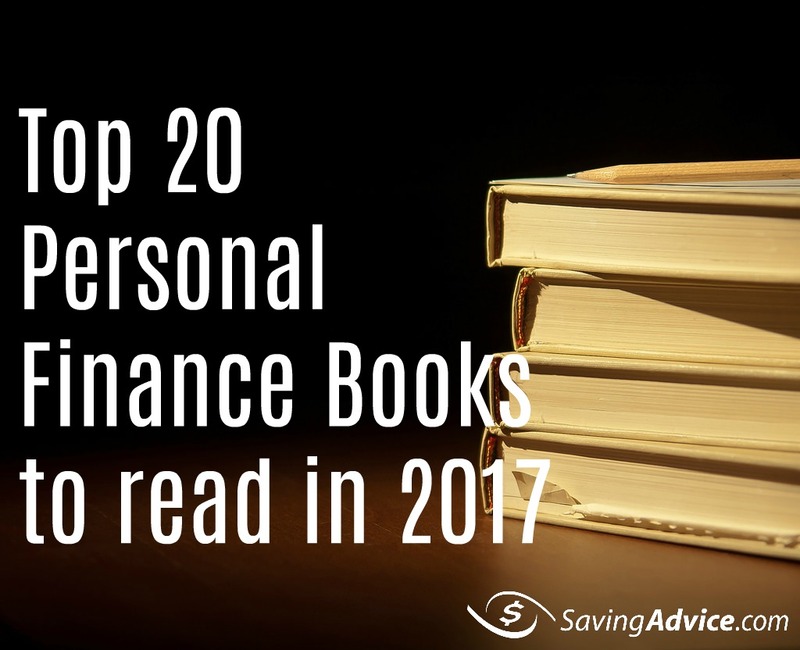 By getting rid of nagging debts, you can put more money aside for retirement, and will also save money on interest payments. Win, win. 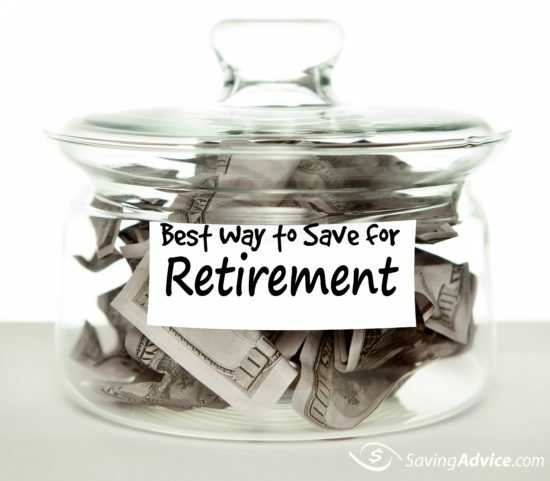 Saving money for emergencies is an important step in your retirement saving process. Having this money available is a much better alternative than putting the emergency expense on a credit card, and in turn, wastefully paying interest. Time is one of the most effective tools in your retirement savings arsenal. By starting early, you give your money more time to compound and work for you. If you weren’t able to save in your early working years and are looking at low retirement savings, there is hope. Once you reach the age of 50, you are now entitled to a catch-up contribution. For an IRA, this is an extra $1,000 per year. For a 401(k), this is an extra $6,000 per year. If your employer offers a retirement plan, take full advantage of it. If they offer a match and money is tight, do whatever you can to get the match. You don’t want to miss out on free money. Try and increase the percentage you save every few months or every year. Do what you can to maximize your contributions. If you have a 401(k) with your employer, the maximum you can put in for 2017 is $18,000 ($24,000 for 50+). If you have a SIMPLE IRA with your employer, the max you can contribute for 2017 is $12,000 ($15,000 for 50+). The money in these accounts is contributed pre-tax and will be taxed when you start withdrawing during retirement. If you maxed out your employer plan contributions and can still afford to contribute more, use a Roth IRA. There is, however, an income cap. If you make too much you won’t be eligible to contribute. There is still a backdoor method to contribute. The benefit to a Roth is the money you withdraw during retirement will be tax-free. The maximum contribution for 2017 is $5,500 ($6,500 for 50+). There are numerous amounts of apps and programs available to simplify investing. Acorns, for example, is a great app that will round up your purchases to the nearest whole dollar and invest the difference in an Acorns investment account. There are a lot of ways that you can help your retirement savings. Creating a budget, paying off debts, and limiting your spending are great steps in this process. By taking these steps, you free up extra money to set aside for retirement. You also have a number of retirement savings vehicles and investment products to help you in his journey. Note: Please consult with a financial professional for advice regarding your personal situation. Do not make decisions based solely on what you read or hear. Congratulations! You are expecting or have just given birth to a beautiful new human. There are a couple of things always associated with a new baby – no sleep and more expenses. There are also ways to lessen the effects of both, but in this post, I will discuss ways to save money with that new bundle of joy. 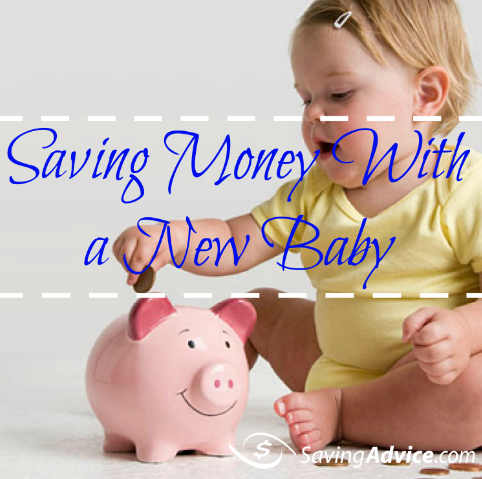 So, how do you go about saving money with a new baby? Breastfeed if you can – I say if you can because it is not possible for everyone. The research for breastfeeding shows it is preferable over the formula for various health advantages. An added advantage is the cost or lack thereof. It is essentially free, with the possible cost coming from breast pumps if you choose to use one. Use cloth diapers instead of disposable – There will always be a debate on the cloth versus disposable diapers, but one thing will always be true, cloth diapers are cheaper. Mint.com wrote an article about the difference in price between the two in 2011 and found that disposable diapers were about $800 per year and cloth diapers were $600 per year. Buy disposable diapers in bulk – If you go the disposable route, make sure you are buying them in bulk. This can significantly reduce the cost per diaper. The diaper size will make all the difference because each size diaper will have a different amount per box. Go hard on coupons – this one is self-explanatory. There are some brands that you are just going to use, plain and simple. You may use Pampers or Huggies for diapers and wipes, so go to their website and find deals and coupons. There are a lot of good comparison shopping coupon sites to get promo codes online from. Create a baby registry – this is a big one. For the baby shower, you should create a registry for people who wish to buy you gifts. This saves you money in two ways. First, people are buying you the items instead of you buying them for yourself. Second, most places will give you a percentage off of anything left on your registry. Babies R Us, for example, give you 10% cash back on every item bought off of your registry, and also give you 15% off of anything left on your registry. Sign up for rewards – there are various companies that offer rewards to people with children. Amazon is one of them. They have a program called Amazon Moms, which is designed to help you find and save on items you use for your child. Pampers is another company that offers rewards. You get points for purchasing diapers and wipes and can use those points to get gift cards, more diapers, and various other items. Having a baby is a very rewarding experience. It comes with many highs and lows, and most definitely comes with costs. Using the various tips laid out above, you can reduce the cost that comes with having a baby. 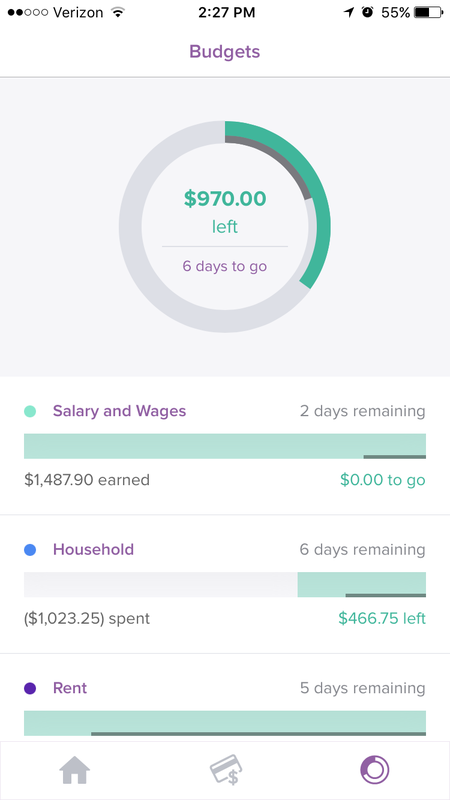 PocketSmith is a budgeting and personal finance software tool that allows you to take control of your money. It allows you to take control of your money through forecasting, or showing you what your finances will look like in the future if your current trends continue. With calendars, budgets, pie charts, and graphs, PocketSmith offers a one-stop shop for all your financial tracking needs. But does it deliver? 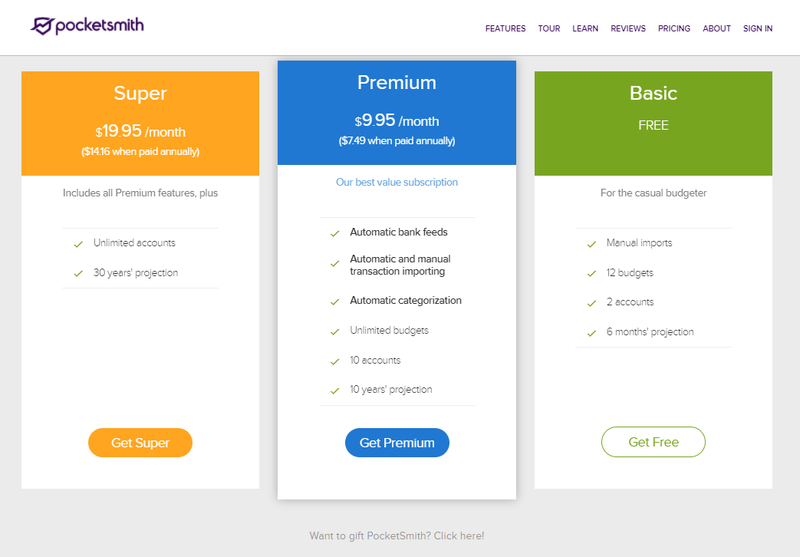 When you create an account, you have to pick one of PocketSmith’s three available plans. Their Basic plan is free and features manual imports and limited budgets, accounts, and projection spans. 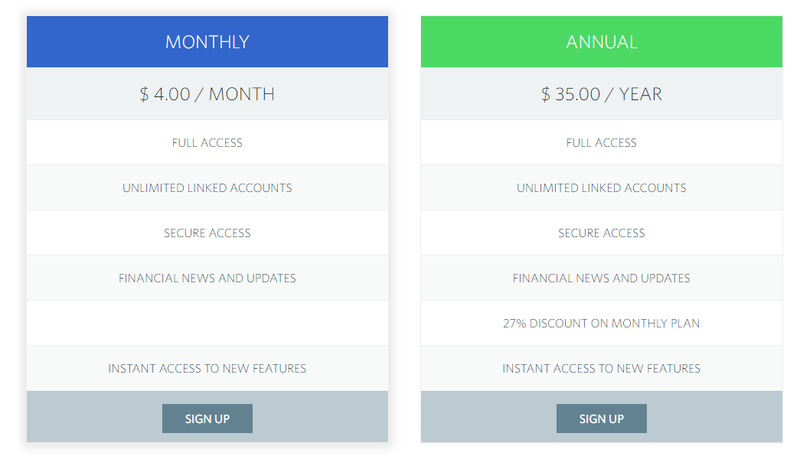 Their Premium plan comes up to $9.95 a month, though the price is only $7.49 per month if you pay annually instead of monthly. This plan makes bank feeds automatic, as well as transaction importing and categorization. It features unlimited budgets and more forgiving limits on accounts and projection spans. Their Super plan comes in at $19.95 a month and $14.16 per month when paid annually, and offers all the Premium features plus unlimited accounts and a larger projection span. Setting up PocketSmith requires three simple steps: adding bank accounts, categorizing your transactions, and creating your budgets and forecast. Everything is smooth sailing after you complete these time-consuming steps. PocketSmith allows Premium users to connect bank accounts. This sets up an automatic bank feed in your account. PocketSmith also offers manual import of bank files or files from popular apps such as Mint and Quicken. You can also use PocketSmith without importing sensitive bank files. To do this, you can either enter your transactions manually, or you can use the Forecast Calendar to run your budget with just a basic idea of your income and expenses. If and when you do have your transactions in the program, you can categorize them. Users with automatic categorization need only set up categories and PocketSmith will categorize in the background. If you do not have automatic categorization, you can create and assign categories for your transactions on the web page and in the mobile app. Finally, when you have your financial information and transactions uploaded, you can create your budgets and start forecasting. 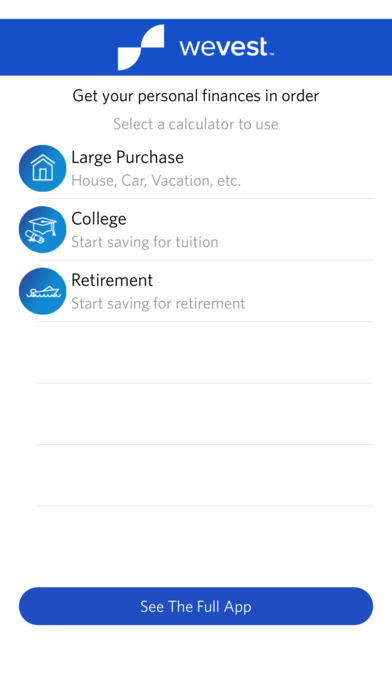 Budgets correlate with your categorized transactions, helping you maintain control of your financial goals. While PocketSmith has a plethora of features, it also has its drawbacks. In my experience, the biggest drawback was the painful simplicity of the app. When you log into your account with the app – because you cannot set up your account in the app, only on your computer – you can view your accounts, manually categorize transactions, and view your budgets. While these are all essential features, they fail to represent the scope of information you can access via the web. In our smartphone world, it only makes sense to have as many standard features as possible available within the app. PocketSmith also offers few alerts for account balances and budget limits. Given its close monitoring of your accounts, alerts about such things as unusual spending, or even notifications and reminders from your calendar, would be a smart and useful addition to PocketSmith’s tools. The short answer is probably. Although it is not perfect, the software is unique and offers a variety of features. 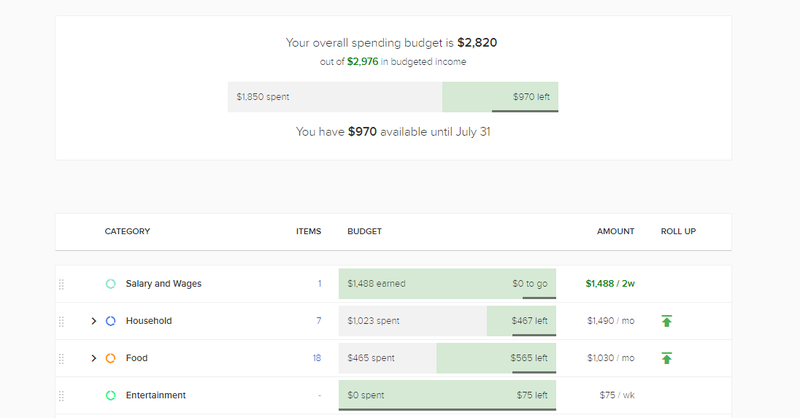 If you are looking for a good start to balancing your personal finances, PocketSmith’s free plan can help you get started creating and tracking budgets with as little or as much detail as you choose. If you have been balancing your finances and budgeting for a while, but are dissatisfied with your current tools, PocketSmith’s Premium and Super plans may offer the added tools and analysis you need. Regardless, PocketSmith offers a positive user experience and a variety of useful features sure to meet your financial tracking needs.